Overhaul of air hammers | 内田工機株式会社　UCHIDA ENGINEERING CORPORATION. For last years in Southeast Asian countries, Uchida has been committed to meet our users’ various demands such as for parts supply, cylinder oversize processing and liner, sub valve replacement, machine processing of right and left frames, V-shape grooving of ram guide, adjustment processing of saw block shank, and on-site processing of anvil by portable milling machine. 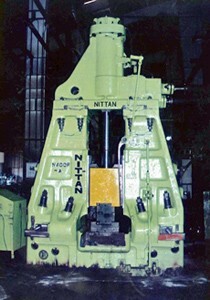 Our home factory is capable of completing the thorough overhaul of 3 metric ton air hammer within 15 days. Cylinder oversize processing can be applied to up to a 6 metric ton class machine, while ram manufacturing is available for up to a 15 metric ton class. In particular, handling of large, hard to shave material, SKT4, is where Uchida is at its strongest.